But I subdued the inclination, the same way I managed to quell the urge to shout in church when I was little. I just never got around to trying it. One thing I am grateful for this Thanksgiving is that my children did not grow up on cell phones and computers. They grew up being outside and reading books. We weren’t a perfect family. We did have minor vices here and there. I told my husband that I think parents should plan how they want to interact with the family during the holiday meal, or maybe even for the whole day. “You mean you want to control everything,” he said. It seems that as we gain faster and faster access to the world at large, we are losing touch with one another. We can Facebook fifty people at once about our reactions to some reality show, but we won’t go across the room to chat with a family member. 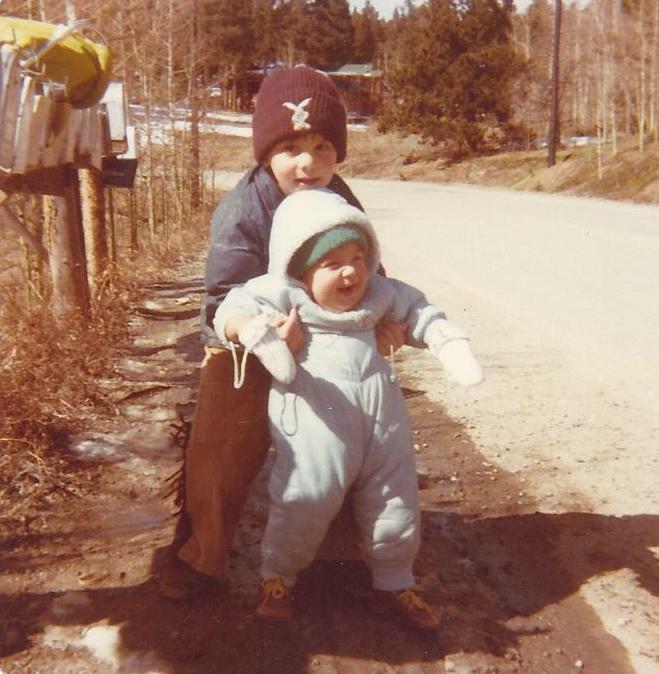 Here’s a story about my own family, a vignette from the Colorado Mountains. It was a time when all we did was make memories. Our little family had grown by that Thanksgiving. We now had two little boys, four and nine-months, and we’d invited several friends to come up for the holiday. I would make the turkey, fresh rolls and pies and everyone would bring something to share. We lived in the Rockies then, at about 8,200 ft. elevation. 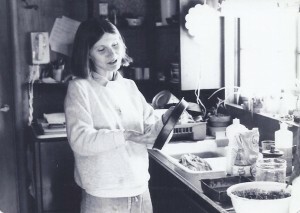 I hung my birds-eye diapers on the clothes line and had learned to split fire wood on the chopping block – a huge round of sawed-off tree trunk outside the back door. I loved everything about it, especially the promise of community. To reach our back-woods valley, one had to turn off a meandering two-lane and shoot down a road down that switched back and forth between aspen-laced mountains and in and out of sunlight. A scant number of houses, barely visible from the road, blended into the pines; but our brick-red cabin stood out, its deck hovering over a sunny south-facing slope. Fences were far and few between. We lived at the end of a narrow dirt lane, home to several rustic (read uninsulated) cabins that sat abandoned, curtains drawn, until summer. One couple, retired teachers from Kansas, had long since headed home; and now dry leaves, clumped under their porch steps and against a stone wall, rustled as though restless and waiting to be tucked in by the first blanket of snow. We hadn’t been invited anywhere for Thanksgiving dinner and had no family for hundreds of miles. The couple “next-door” planned to entertain family and friends, mostly from the nearby town where I did my grocery shopping. And so we invited guests, too, including some friends of mine and one of my husband’s co-workers. Thanksgiving fell on November 22 that year. On the 19th it began to snow. The blizzard that ensued was one of the biggest in Colorado’s history. White crystals slapped our window panes and obscured the space between our cabin and the vast mountain across the valley. Clouds engulfed us and every remaining patch of blue. The day before Thanksgiving I began my preparations. I puttered with pie crusts, trying to finish the fickle things before the baby cried. Me, baking in the cabin kitchen. A few early-morning elk nosed through a stand of aspen below my kitchen window. I watched them between the branches of pine trees that grew so close to the house I could have reached out and touched them. Suddenly, the neighbor’s dogs, a couple of “newfies,” barreled onto our property, barking like lunatics. The elk scattered. The house smelled of pumpkin and spice. 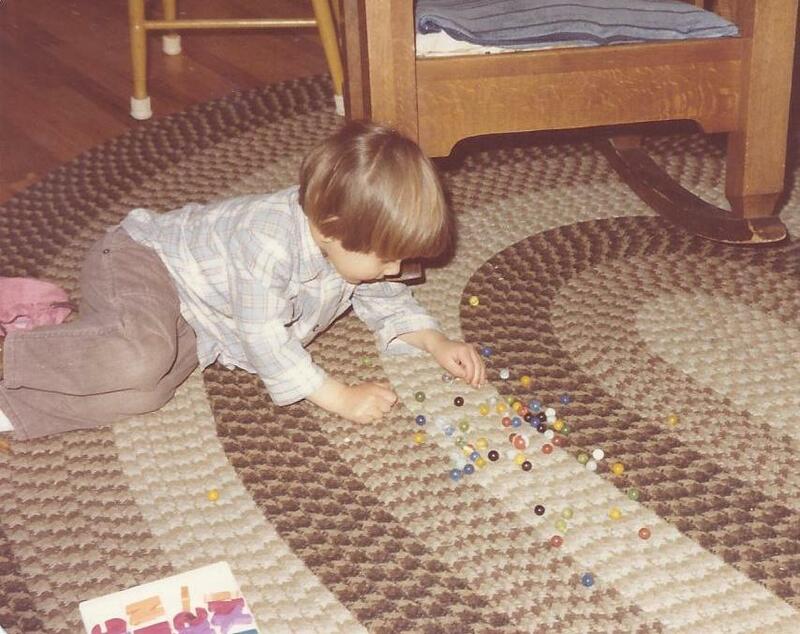 My older guy played with his marbles on the braided rug until he got bored and then lugged a chair over to the kitchen counter. He climbed up and I pulled a small clump from the ball of dough I was kneading. It was the basic recipe from the Tassajara Bread Book and I knew it by heart. He patted the mound and mimicked my motions. It would be his own little loaf. 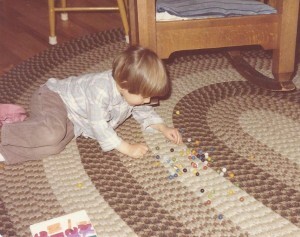 Playing marbles on the braided rug. Denver had received 17 inches of snow, but we had closer to three feet. When the snow stopped I took my son outside — cabin fever had set in. We stood in a clearing the size of a trash can lid that had been laid bare by the wind. The snow was too deep to take even a single step. In anticipation of the storm, my husband had parked our car by the mailboxes along the valley road. That way he’d be able to get out. I remained optimistic that our friends would still be able to come. That evening, the inevitable happened. My friend called and said they definitely weren’t coming. It would do no good for them to try and make it because of the roads. My husband’s co-worker called to say he’d wait and see what the roads were like in the morning. Maybe he’d come after all. But the next morning the roads were horrible. Our little family would have Thanksgiving dinner alone. Of course I had much to be thankful for, but I cried just the same. Opportunities for guests were far and few between. I remember a time when I was four and our neighbor’s granddaughter was supposed to come and play. I waited out on the driveway but she never came. Sad and disappointed, I couldn’t tell my parents how I felt. Crying was strictly frowned upon. Despite my picture-postcard surroundings, I lacked support. My best friends lived a good distance away and I rarely saw them since we’d moved to the mountains the year before. The women in the valley had older children and seemed forever engaged with hobbies like spinning and weaving and raising goats and chickens; or they worked outside the home. Like our family, they were year-round residents. We could walk to one another’s homes cross-country, adventuring down wooded paths or by side-stepping the mountain. But I was the only stay-at-home mom with such little ones. My days were filled with reading stories, preparing food, doing laundry and nursing the baby. The boys down by the mailboxes. 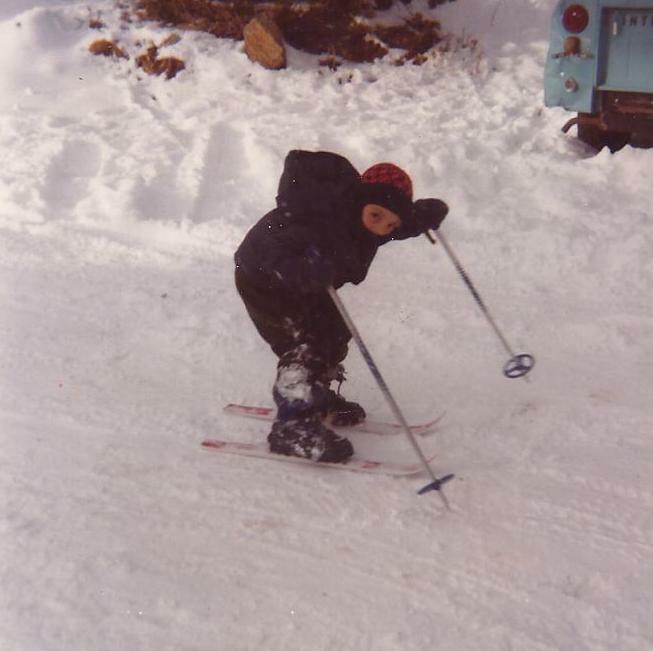 I tried to learn as much as I could about mountain living. In August, ripe clusters of wild chokecherries had been free for the picking. I read up on how to make wine with the “balloon method” and now had four bottles of chokecherry wine beneath the kitchen counter, getting stronger by the day. People rarely use chokecherries any more, although generations of Native Americans dried their pulp for its nutritional value. If it worked, the wine would make fine Christmas gifts. I also made rosehip jam. I bought an antique fruit press at the flea market and all summer waited for the rose hips to reach their peak. On the morning of the first light snow, I ran out with pots and pans, worried that the moisture would ruin them. These were gigantic rosehips, the size of cherries. I pressed out the pulp and filled about a dozen pint jars. I took pride in my small accomplishment, and set the jam jars in an open cabinet where I could admire them. Just as I had watched the rose hip pulp bubble down in the pan, I watched the autumn days dwindle, too. Fewer and fewer aspen leaves spun to the ground and each day the sun disappeared a little earlier behind the mountain. Indian summer had come to an end. On Thanksgiving morning I heard laughter and rowdy shouts out in the lane. When I opened the door to see what was going on, a mist of sparkling crystals dusted my hair and face. A bunch of people in hats and parkas had parked their cars at the mailboxes. 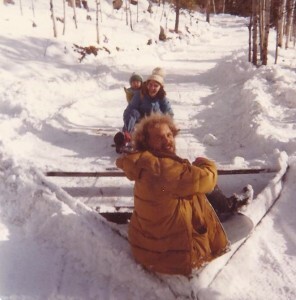 They pulled sleds laden with groceries down to my neighbor’s house. The lane emptied and all that was left was blinding sunlight reflecting off the snow. I realized it was up to me to make the memories. My husband helped with the kids while I finished preparing our dinner. I had made little corn husk pilgrim people for the table. My son colored construction paper placemats and made a little turkey with feathers by tracing his hand. Engaging children in Thanksgiving does not require an invitation from Miles Standish. But it does require planning. It’s a time for teaching children how to set the table and for practicing manners – not for texting or playing video games. And they should say “hello” and learn how to speak to people, instead of just skulking off because they think there’s someplace else they’d rather be. Before digging in, families can join hands and have everyone remember something they’re thankful for, even if they aren’t religious. Thanksgiving means giving thanks. I once interviewed a cookbook author for tips on engaging the family at holiday time. She said the first thing she does is have everyone park their cell phones at the door. She does something else that I really like, too. She gives everyone a slip of paper with a family member’s name. The recipient has to write a description of that person’s positive traits and talents, and what that person means to them. After the meal, the papers are read aloud like fortune cookies. She says people hear wonderful things about themselves they didn’t even know were true. My three-year-old grandson likes to Skype with his auntie on the east coast. He calls it “face time.” It’s an apt description of what all kids want.